MISSION STATEMENT: The mission of Sunday Shoes is to lift up the name of our Lord and Savior, encourage His followers, and share His unfailing love with a world that needs him. Through the medium of contemporary Christian music, they want to express the hope that can only be found through a personal relationship with Jesus. An important part of our music reviews is to profile the artist(s) behind the music being evaluated and explored. In this process of researching and reviewing each Christian music artist(s) / group, this reviewer finds it fascinating how the Lord reaches out / redirects / prepares / guides people down the right path, working and molding people in preparation for proclaiming the good news of Jesus Christ through their gifts. When interviewed by Christianmusic.com, Danny Van and Daniel Epp readily shared about their growing up years, their struggles, their personal Christian testimony story, and how the Lord changed them to serve Him in a future music ministry that they hadn't even considered at the time. Danny Van shared with ChristianMusic.com: "I grew up in a great Christian family that loved music. It seemed I learned all about God but never really knew Him. When I got out of high school, I started a rock band and the Los Angeles club scene. Hanging out with the wrong crowd, I started experimenting with drugs and alcohol. After too many years of substance abuse I reached the bottom. That's when I looked up to Heaven, and spoke that simple prayer, 'God, if you are real, help me.' He did and I soon discovered that Jesus wanted to know me personally. My life has never been the same since." Daniel Epp shared with ChristianMusic.com: " My experience is very similar to Danny's. I was raised in the traditional two parent Christian home with great parents in the suburbs of Los Angeles. I was almost the 'poster child' for Christian Education until my senior year. I experienced a series of athletic and relational setbacks that got me down - mostly on myself. I felt rejected by God and drifted away from the church." " In college," Daniel continued, "I began looking for life in all the wrong places and felt empty as a result. I began trying to mask my disappointments with drugs. My turning point came after winding up in the emergency room after a weekend party. I thought very hard for the next few days about how close I came to the edge of the cliff." "Right after that," Daniel explained, "An old friend from my high school called me. He invited me to go to a concert at Calvary Chapel, a church, according to my friend, 'Where they play rock music and have a preacher who has hair longer than ours!'" "That night, the pastor shared a verse from Jeremiah 29:11 that said how God had planned good things, not harmful things, for my life. When I accepted the Lord on that Saturday, God took my disappointments and emptiness, and in return gave me joy, purpose and something bigger than myself to live for. I never had a reason to touch a drug again after that, and despite my struggles, never have." It is always interesting / fascinating to explore how the Lord prepares / leads music artists into the ministry of writing and singing songs, molding their thoughts, attitudes and ways of looking at things along the way. Danny Van and Daniel Epp first met each other through their individual involvement with the music ministry at Emmanuel Church. Pastors Harold and Ken Korver loved to have original music for the Sunday morning services, and would give Danny and Daniel a call on the Wednesday before, to compose a song that would reflect the theme of the upcoming Sunday service, which they would sing as well. It was the beginning of their music ministry for the Lord as a song writing/ performing duo, though they didn't fully realize it at the time. From these experiences from working together on a tight time frame, Daniel comments, "It could be a little hectic but we loved it, and found we worked well together." This partnership facilitated by the Lord was off and running, though not exactly in the direction the Lord had in mind. But, not to worry! The Lord is patient, willing to work with, guide, and tinker with human beings' heart attitudes evolving human thinking through his Holy Spirit to fall in line with His will for them. Christians are a work in progress. So, Danny Van and Daniel Epp decided to work together, but not in Christian music. They returned to what they knew well and had success in; the secular music world. They began writing secular songs for secular artists, but didn't find it quite satisfying...... sometimes downright annoying / frustrating! Daniel Epp explains this well-intentioned detour: "In an attempt to hurry things along, we began writing secular songs and had several songs "signed" to both L.A. and Nashville publishers. It wasn't very satisfying however. We were always writing songs for someone else, many times anonymously, around themes and topics that were many times contrived, and that didn't always bring glory to God. It could be maddening. You'd loose a cut on an album at the last second because the producer said something rude and got fired by the artist." Daniel Epp shares with ChristianMusic.com the way the Lord convinced them, redirected their steps, molded their thinking, and heart attitudes, leading them to use their musical talents for Him. "The Lord convinced us at a Promise Keepers rally. Max Lucado spoke about 'Dropping your nets,' and following Jesus. A net, he said was anything that kept us from being used to our fullest for God's kingdom." Daniel continues, "When he asked the question, 'So what's your net? ', we both arrived at the same answer. We need to commit all our gifts to Him, including our music. We started writing some new songs and began trying them acoustically at local Christian Coffee Houses and other Christian events, having no idea where the road would lead." During 1996, Danny Van and Daniel Epp prayerfully considered this idea of switching from writing secular music for other artists to writing and performing music that they truly believe in; music which reflects their faith and love of Jesus Christ, and the purpose and fulfillment which comes from a life committed to walking with and serving Him. Fortunately, for the spiritual blessing of Christian believers, seekers, and this music reviewer, they were moved by the Holy Spirit to start writing music for their new goal; becoming involved in a Christian music ministry, as Christian song writers and performers. Stepping out in faith in uncharted territory, writing and performing Christian music proved to be a heart-attitude changing / faith developing experience, for both Danny Van and Daniel Epp. Daniel shares with ChristianMusic.com, about how the Lord has changed them through it all. "If we're being honest, we once viewed our music primarily as a vehicle for achieving our own goals and ambitions. If someone happened to be blessed along the way that was OK. When our definition of success didn't happen, we got frustrated and almost quit. But we didn't. We kept showing up, and something happened. God began changing our hearts. We started tuning in more to the people we performed for and began sharing more of our own struggles, encouraging them not to give up. We stopped striving so much, discovering that being effective depends on God a whole lot more than it does us." Danny Van and Daniel Epp's music and talent has brought the Gospel to "more than 200 churches and concert events across the U.S. a ten day outreach tour with Morningstar Chapel to Kiev, Ukraine," and others in the Christian music audience, ministering to people seeking something bigger than themselves to live for, a source of unconditional love, joy, and hope - Jesus. Daniel shares, "We now see our music as a vehicle for ministry. To receive feedback that God used us in some small way to help a struggling brother stay sober one more day, or a sister to return to her estranged husband and kids, or to bring a little joy back to someone going through a really hard time....That's a great feeling." Danny Van and Daniel Epp became strong, passionate supporters of the Celebrate Recovery Ministry, a Christ-Centered program, started by Pastor John Baker from Saddleback Church, a recovered alcoholic himself. The program offers help for both Christians and non-Christians struggling with their hurts, habits, hang-ups, and addictions. For the past five years, SUNDAY SHOES has performed their songs at Celebrate Recovery events and concerts across the United States, not only because of their musical talent, but also to share their personal testimony. They can offer a powerful testimony which encourages people to not give up and depend on the Lord. Daniel Epp explains, "We openly write and share about the struggles we've had with substance abuse in the past." Summing up their walk with the Lord, Daniel concludes,"It's been an amazing journey as God has transformed us from two ambitious, self promoting musicians into ministers of the Gospel, promoting the best news ever heard by man. That God loved us and paid dearly to have a relationship with us." Danny Van: "Men of faith like John Baker, Rick Warren, Chuck Smith, and my own Pastor Ron Wilkins have all influenced me greatly." 1) "For ten years, I was a member of Emmanuel Reformed Church in Paramount, CA. While I was there, I learned about, and experienced God's 'Grace stacked upon Grace' from Pastors Harold and Ken Korver, two of my heroes of the faith." 2) "I'm now a member of Saddleback Church. Every week, I'm challenged by Pastor Rick Warren to live a life of purpose, and to kick a dent in the fender of history for God." 3) "My Dad, or 'Saint Eugene' as I call him. He's been walking with the Lord many years now and as a result has become one of the most humble, kind, strongest yet gentle, patient, loyal, and forgiving men that I know. He is also Sunday Shoes' biggest fan!" 4) Pastor Bob Pascoe, the greatest encourager and prayer warrior in my life. When he prays, I feel like I'm in God's living room. As their fan base grew, They have recorded their songs and put together three albums of songs, whose titles suggest elements important in their own spiritual journey, which connect to many; DANCIN' ON THE EDGE, BROKEN GROUND, and their newest musical effort, SIGNIFICANCE, which is the album which will be explored in this review. In reviewing an album, one must not forget to mention the album's music producer, who is responsible in coordinating / directing how the songs are presented / recorded on an artist's album. Danny Van and Daniel Epp's music producer for this album was the very talented fellow Christian by the name of Tony Guerrero, who Danny and Daniel truly appreciate and admire, for a host of qualities and gifts that guided the production and final musical product of SIGNIFICANCE. 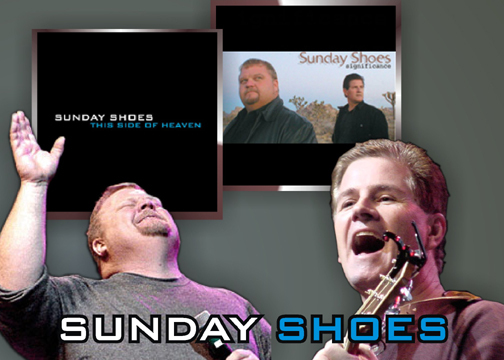 The teamwork of SUNDAY SHOES and Tony Guerrero resulted in offering a fabulous collection of songs, which bring glory to God and offer the listener the hope and love we have in Jesus Christ. Daniel Epp shares his thoughts about Tony: "Tony is the quintessential 'Renaissance Man'.. I think we're going to nickname him 'The New Q'. Like Quincy, he simply does it all; virtuoso jazz player, composer extraordinaire, killer arranger, skilled recording engineer, talented graphic artist, plays flugelhorn, keyboards, guitar, (is there anything he doesn't play?). He is a sometimes philosopher, Christian apologist, teacher, psychologist and collector of wisdom, trivia, and Sachmo memorabilia.. He is always soft spoken, humble, gentle, kind, unruffled, and professional. In short......working with Tony is a joy!" There are many exciting, memorable inspiring elements of this collection of songs which this reviewer really enjoyed and was blessed by, one of which is their unique style of music, which uses a variety of genres, and a variety of vocal styles as well, depending on the message and spirit of the song. As this reviewer recognized and appreciated the special unique musical qualities of SUNDAY SHOES, we thought it would be enlightening for us all to explore the details with Danny Van and Daniel Epp. Daniel Epp shared with ChristianMusic.com, "Our music is at the intersection where rock, blues, country rock, and soul collide. We tend to be more song driven than genre driven. We let the song dictate to which of those influences it leans the hardest. That probably makes some of our albums a little uneven in places, but we would get bored doing the same thing all the time." A characteristic of a great album, like SIGNIFICANCE, is having a variety of dynamic musical sound found in both the compositions and vocals, making each song a unique vehicle for the message trying to be expressed for the spiritual benefit of the listener. The added sparkle, zing and poignancy of the songs are the interesting vocals and impressive duo harmony provided by Daniel and Danny, which highlight their vocal versatility and talent. Their diverse vocal sound is always the perfect vehicle for the both the message and catchy, memorable melodies, sitting nicely on top of the musical accompaniment, which is nicely produced as well. Danny Van shared, "Van Morrison, CCR, U2, John Hiatt, Sheryl Crow, Bonnie Raitt, Stevie Ray Vaughn, and of course Steven Curtis Chapman who taught me that you can be a Christian and still rock the place." Daniel Epp shared his list as well: "Crosby, Stills, Nash and Neil Young, The Eagles, Tom Petty and The Heartbreakers, Stevie Ray Voughn, Don Henley, U2, Bonnie Raitt, Bruce Hornsby, Ray Charles, Marc Cohn, Steven Curtis Chapman, Bryan Duncan, Third Day, and Jars of Clay. ChristianMusic.com had to know.... How do you compose your songs? Daniel Epp filled this reviewer in: "We can work on a song almost anytime, almost anywhere, which drives our wives crazy (it comes when it comes). Most of our songs are composed in the studio mostly on guitar, with the piano used to compose the ballads. Another irresistible characteristic of this collection of songs are the wonderful lyrics which express so well explore the significance of being in a relationship with Jesus Christ through His Holy Spirit, as it affects our daily life, our daily relationships, and the way we think and step out in faith. ChristianMusic.com asked Daniel and Danny who creates their lyrics and who composes the music. Daniel Epp explains, "We both do lyrics and music. Danny (He won't say it so I will) is especially gifted at coming up with great concepts and titles. When you have that, it seems like 90% of the work is done. The song almost writes itself." Daniel Epp continues, "An example of this......Danny and I were sitting on the L.A. freeways writing another song on our cell phones (this makes Verizon very happy) and he throws out the phrase, 'Oil and Water'. I said, 'yeah, sin in a Christian's life is like that.' By the time I had turned off my exit, the song was practically done." So, let's review! Many exciting, memorable inspiring elements in this vibrant collection of songs which come together in a unique way can be found and enjoyed by the listener, while being blessed by the spiritual messages so well expressed and presented in these inspiring musical efforts. Interesting combinations of genres used to express each song, great dynamics, a variety of vocal styles, memorable, catchy, sometimes poignant melodies and inspiring lyrics which clearly express the message of each song are all great reasons for buying SIGNIFICANCE. I highly recommend this collection of songs which have a refreshingly different creative edge, and inspiring messages as well, sure to bless the listener. * * * + + SILENT NO MORE - Words and Music by Daniel Epp. Second favorite song of this reviewer. Wonderful combination of blues, soul and rock, to start this album off to a energetic start. Funky, bluesy, intro by electric guitars provides perfect launching point for first verse melody and vocals, which start off softly, building in dynamics and intensity to the joyous declaration made in the chorus. Light use of strings adds bulk, fuller feeling to the song, but doesn't overwhelm the inner voices of the counter melody provided by the electric guitars & bass, or obscure the fine nuances / dynamic expression of Danny's excellent vocals, which sit nicely on top of (soaring above in some parts) the lightly cooking musical accompaniment. Nice effect of plucking unison strings of both guitars and string ensemble, adds musical sparkle to the interlude before the Bridge section. Something deep inside me is bubbling out, My joy is overflowing and there is no doubt I've been changed, I have been changed. It feels just like a giant is waking up, I think Mount Vesuvius is about to erupt So here I go, Here I go. Chorus: I'm gonna go crash, Gonna boom, Like a rocket to the moon, I will be silent, no more! Gonna stand up, Gonna be proud, Shout His praises right out loud -- Hallelujah! Got an ocean of His love pouring over me Like the wave that meets the shore, I will be silent no more. Hook: I will be silent, silent I will be silent, no more! I will be silent, silent I will be silent no more! no more! I will be silent. Silent no more!! * * * + SECOND MILE - Words and Music by Daniel Epp & Danny Van Hofwegen. This peppy, well-composed inspirational song encourages the listener to go the second mile for the Lord. I would describe it as an spirit-lifting, energetic acoustic rock with nice support / blending of electric guitars, with some delicate background keyboard work, and of course a driving drum beat. - Acoustic and electric guitars are nicely integrated adding a strong rock feel, giving support to melody and the strong duo harmony in the fine vocals by Daniel and Danny, all which provides the perfect showcase for the lyrical message. Nice dynamic & mood change in the Bridge - Soft, moving acoustic guitar is softly supported by electric guitar chordal work, loosing the drum beat, as the sensitive poignant vocals sit delicately on top, as the lyrics in this part are the explanation point of the song's message. Segues into joyous chorus, with a lively electric guitar rift. Seventy times around the sun, Then my life is gonna be done, yeah! I don't want to wake up someday, Thinking I threw my life away. Yeah! Oh no! The road I take to heaven, Just might save someone from hell I don't want to just run the race, I want to run it well. Chorus: I want to go, I want to go, Go the second mile, I want to go the second mile (repeat). Hook: Can't stay gotta go, Don't you know, So here I go Can't stay gotta go, I gotta go, The second mile, The second mile. * * * + + RISING - Words and Music by Daniel Epp. Another real strong favorite of this reviewer. It has to be my favorite song dedicated to 911 composed over the years. An inspiring anthem of comfort, hope, and encouragement because we have the Lord to hold on to, to fill us with His love, His power to see us through our worst storm. This song is a great blessing for anyone who has suffered personal tragedy / loss. Verse melody is written in a minor key, which segues into a major key in the Chorus / Bridge. Enjoyed the great dynamics, strong vocals, and the comforting lyrical message, inspiring harmonies in the Chorus, beautiful melody carried / supported by nicely composed accompaniment for the string ensemble. Darkness will fall, And your tears may last for the night. Just remember through it all, Your joy is gonna come back in the morning light. There is no power, That can come against a heart, That's been filled up with his love, His wondrous love. Chorus 1: You can tear a tower down, It can tumble to the ground. But our spirit will be rising. They can come against our faith, But you can't take that away. No, our spirit will be rising. Rising up! It will be rising, Yeah, yeah, yeah. Sorrow will come, Just as sure as the storms bring the rain. I know blue skies will shine, And once again we'll watch the seasons change. And in a world where nothing stays the same, His promise will remain, It will remain. Chorus 2: You can tear a tower down, It can tumble to the ground, But our spirit will be rising. They can come against our faith, But you can't take that away. No, our spirit will be rising. Rising up, like an eagle in the sky. Rising up, Rising up so high. Hook: We will be rising, rising We will be rising, rising, rising We will be rising. * * * + SIGNIFICANCE - Words and Music by Daniel Epp & Danny Van Hofwegen. This title song is a solid, contemporary praise anthem with a splash of SUNDAY SHOES soul and blues, sung with joy and enthusiasm, which clearly expresses the inner joy, a sense of purpose, of connection which comes to believers through the Holy Spirit because of belief and faith in Jesus. Keyboards, guitars and background strings delicately support the vocals in the verses, becoming stronger during the chorus and Hook. Song has a springy, peppy, light rhythm, a catchy melody, the usual effective dynamics and expressive vocals, and bright soulful harmonies performed in SUNDAY SHOES style in the chorus. Bridge sparkles with excitement as the vocals and accompanying music express the exclamation point of the message of this composition. Very nice electric guitar rift heard in the Hook. I've got a brand new feeling, I've never felt before. There's a whole new concept, Knocking at my door. It's the thought that life is beautiful, And I think I've found something deeply profound. And it's so profound. (Louder) Chorus: Suddenly it seems like everything makes a difference. For first time in my life I think I've found Significance, Significance. Significance. Significance. Bridge: I've found the way and I know the truth yes. I've seen the light and I know it's you Lord. Right through the darkness, Your love came shinning through! It came shinning through! (Nice electric guitar solo) Hook: (Na na na na na na na na na na na na) I've got a new sensation. (Na na na na na na na na na na na) na Significance! Significance! Significance! Significance! * * * + + OIL AND WATER - Words and Music by Daniel Epp & Danny Van Hofwegen. Another strong favorite of this reviewer, a very unique prayer \ worship hymn composed in a minor key using genres one normally doesn't hear for a prayer \ worship hymn. Enjoyed the great mix of acoustic/electric rock, with elements of hard rock / blues / soul in vocals and accompaniment in Bridge, which is a heartfelt prayer to the Lord, the exclamation point of the message of the lyrics. Listener hears a variety of vocal styles, SUNDAY SHOES style, which makes the song interesting and adds zing and poignancy to the lyrics, enhancing the message. First two stanzas of each verse, cooks along quietly with acoustic guitars and light drums. Next two stanzas of each verse, the electric guitars join the ensemble, and the dynamics grow louder into the chorus. Danny comments: "OIL AND WATER is one of my favorites. I really had a great time in the studio with this song. The lyric always reminds me where I live." I don't walk barefoot over broken glass, no I don't. And I'd never throw matches in a room full of gas, oh no Only a lunatic would put a snake in a baby's crib. So why do I think I can play around with sin? Chorus: Oil and Water, Darkness and light, The two together can never abide And if I serve them both, I surely will die. Sin in my life is like, Oil and water. Oil and water. * Bridge: Redeemed (redeemed) is what I am (is what I am) , what I am! Your child (your child) is who I am, (is who I am!) Redeemed (redeemed) is what I am (is what I am), Your child is who I am(is who I am!) . It's who I am, It's who I am, It's who I am. Chorus 2: Oil and Water, Darkness and light. The two together can never abide And if I serve them both I surely will die. It doesn't have to be Oil and water, Oil and water, Oil and water, Oil and water. * * * + MADE FOR THIS - Words and Music by Daniel Epp. Another great acoustic/electric combo rock song blended with elements of Gospel blues & soul, SUNDAY SHOES style! Love the acoustic guitar and keyboard work in the verses, and the strong entry of the electric guitars in the Chorus and Bridge 1 and 2, and of course the creative Hook! The usual great vocals, and great harmonies effectively and most enjoyably bring the message of song to life. One of Daniel's favorite songs: Daniel comments: "MADE FOR THIS - Especially when we perform it live....I just love to see people, especially new believers, smile when they get the message that they were each made for a divine purpose." The smile that you're wearing looks good on you. It goes well with your brand new attitude. I can tell, yes I can, You were made for this. You've got a fire in your eyes, I guess it's really no surprise, Cause I knew all along You were made for this. Chorus: Living a life that's full and free, This is who you were meant to be. When I see the things That God has done in you. Well I know it's true. You were made for this. * * * + FORGIVE ME AGAIN - Words and Music by Daniel Epp & Danny Van Hofwegen. Lovely acoustic ballad which tells a story of a marital fight, and the decision to turn from personal pride and to say I'm sorry, in order to follow the example set by Jesus. Beautiful, sad melody carried by piano with light support of guitars (acoustic and electric). Expressive dynamics add a dramatic sparkle. Poignant, heartfelt vocals are the perfect vehicle for the lyrics. Great harmonies in Chorus. Daniel and Danny comment: "I think any one who's married (and both of us are) can relate with what this song says. The song was definitely written by two imperfect husbands." She's locked in the bedroom, Wrapped up in her silence again. I'm sitting in the kitchen Enjoying my pride. And this little squabble. Didn't amount to nothing at all. Still I'm not gonna bend At least not tonight. Who's gonna be the first one. Tell me who will it be. If I'm gonna be like Jesus. I guess it's gonna be me. Chorus: Forgive me again, I'm sorry! Cause I know that I've broken your heart. I'm down on my knees Please help me. To find what we had at the start. Forgive me again. I sit down beside her. And I take her trembling hand. I Whisper I love you. As she looks in my eyes In that tender moment, Love conquers pride, And the walls tumble down, Fools become wise. * * * + ALL THINGS CONSIDERED - Words and Music by Daniel Epp & Danny Van Hofwegen. Another solid contemporary worship song with an easy, catchy rock beat, containing a strong lyrical statement of faith and gratitude, that reminds the listener that the most important blessing that matters at all that Christians have is that they are loved and belong to Jesus Christ. Composition is put together nicely with a catchy melody supported by inner voices provided by keyboards, electrical guitar chordal support, with perhaps an organ or synthesizer, which creates a nice full sound. Lead vocals and duo harmony are most enjoyable, and effectively carry the message. Sitting on the side, Of the freeway of life, I can't believe how fast. These days go rushing by It's easy to complain. About things that might have been. But I'd rather give thanks For the place that I'm in. Chorus: All things considered when the day is done. Somebody loves me and that someone is God's only son All things considered when my life is through The only thing that matter's at all. Is that I belong to you, Oh -h, yes I do. I belong to you, Jesus, Yes I do. And I've got the best, I've got the best, I've got the very, very, very, very best. I've got the best, I've got the best All things considered. * * * + LAY IT DOWN - Words and Music by Daniel Epp & Danny Van Hofwegen. Great combination of rock, Gospel blues and soul, with a soft touch of acoustic guitar work in the Hook. Rhythm and beat of the song cooks nicely along, supported by musical accompaniment, steady drum beat. Very nice electric guitar bluesy counter melody rifts. Daniel Epp & Danny Van are versatile vocalists and their talent is evident in this song. Lead vocals have no trouble at all hitting really high notes in the chorus, and all the notes in-between. Nice variety of vocal styles and dynamic presentations, along with SUNDAY SHOES harmonies. Footsteps down a hallway, Such lonely sound. Happiness leaves early, And heartache sticks around. Oh my friend it's hard I know, But it's time for letting go. Chorus: Lay it down, lay it down, Don't you cry no more. Lay it down, Give your heartache to the Lord Lay it down, lay it down, Your joy will be restored. Lay it down, lay it down, lay it down...Lay it down. Underneath the surface, Hiding in the dark. Worry is a monster, That creeps into your heart. But it'll be gone without a trace The day you replace your fear with faith. Chorus 2: Lay it down, lay it down, Don't you cry no more. Lay it down, Give your worries to the Lord Lay it down, lay it down,Your joy will be restored. Lay it down, lay it down, lay it down... Lay it down. Bridge: Lay it down. Jesus gave his life for you now. Lay it down. You don't have to be alone. Lay it down So no matter what your problem. You can lay it down at his throne. (Repeat Chorus 1) Lay it down……. * * * + + NOW THAT I'M YOUR CHILD - Words and Music by Daniel Epp & Danny Van Hofwegen- Lead Vocals by Rick Muchow. Rick Muchow is the worship music director at Saddleback Church and knows SUNDAY SHOES well through Saddleback church and Celebrate Recovery. Third favorite song of this reviewer. A lovely, acoustic prayer hymn, sung by Rick Muchow with feeling and clarity. Acoustic guitars delicately play broken chord accompaniment, with background piano and strings lightly join the musical accompaniment. When I was broken, You put me back together again. When I was lonely, You became my friend. Chorus 1: And now that I'm your child, And I've felt your healing touch. Now that I'm your child, The hurt doesn't hurt so much. Now that I'm alive, My dreams are running wild. Life is wonderful, Life is beautiful, Now that I'm your child. Bridge: I just want to thank you. I want to thank you Lord. I just want to thank you For all you've done, For all you've done. Hook: Oh my life is wonderful, Life is beautiful, Now that I'm your child. * * * + TIP OF MY TONGUE - Words and Music by Daniel Epp & Danny Van Hofwegen. Another nice combination of Gospel, and soulful blues with an easy, laid-back beat, liven up this worship prayer hymn, asking the Holy Spirit to give the right words to help another person through a trial. One of Daniel's favorites. Daniel comments: TIP OF MY TONGUE - I just love the way Danny interpreted the lyrics." When I see a sister who is crying, Or a brother who has lost his way, Let me show them how much you love them Give me all the right words to say. Chorus: On the tip of my tongue, The tip of my tongue, Let your word be on the tip of my tongue From the first light in the morning, Till the setting of the sun, Let your word be on the tip of my tongue. Hook: On the tip of my Tip of my, tip of my tongue ( repeat 2x's) Let it be, let it be, let it be, On the tip of my tongue. * * * + + WILDEST DREAMS - Words and Music by Daniel Epp. A great country / acoustic upbeat worship song kept moving by inspiring acoustic guitar work. Love the melody, energy in composition, the expressive vocals and meaningful lyrics of this song. Perfect song for contemporary worship service in any denomination or family camp event. Fell in love with the marvelous acoustic guitar work with light touches of keyboard and perhaps a concertina or other squeeze box, and the smooth, expressive vocals, which again present the perfect vehicle for the message being proclaimed. In memory of my loving mom- Ann Elizabeth Epp. For anyone who's waited, For a letter that never came, For anyone who's spent the night, Standing in the rain While you cried on the outside, And died on the inside. Chorus: I know the one who felt your pain, When he died upon that tree. He took every nightmare that this world could give Just so you could dream. Your wildest dreams (you can dream), Your wildest dreams, You can dream your wildest dreams. Bridge: I've heard it said that eyes have never seen before. The wonders and the miracles that lie in store For those who have the courage, And the faith to believe, In the one who can do so much more. Than anything we've known before. Hook: Your wildest dreams, (You can dream), Your wildest dreams. (Go ahead and dream). Your wildest dreams (Close your eyes and dream.) Your wildest dreams. You can dream your wildest dreams. * * * + + KEEP CHIPPING AWAY - Words and Music by Daniel Epp. Favorite song of this reviewer. What a wonderful way to end this inspiring CD. A simply beautiful prayer hymn of confession and petition, asking the Lord to continue to mold the soul, expressing the need to be changed by the Holy Spirit. This inspiring composition which features a lovely piano accompaniment, moving melody, poignant, soul-searching, heartfelt vocals, and very effective dynamics. Dynamics build very nicely, starting very softly and increase throughout the verse into the chorus, and quiets down in beginning of following verse. It is one of those special songs that wraps around one's heart, inspiring self-reflection, and to ask the Lord to help in personal struggles and weaknesses. Daniel comments: "This song almost didn't make the album. It's about the helpless and frustrating feelings that come from being a perpetual work in progress. I wrote it in one of those classic valleys that comes after the mountain-top. It came out all out once with no editing. Because of that, it's probably the most transparent self-revealing song on the album. At first I thought it would be for only myself and the Lord, but when I played it for Danny, he insisted we put it on the album and put it in the set. I guess more Christians must struggle with those feelings than I thought. We get a lot of feedback whenever we perform this one." Something's got to give, Don't know just what it is. Can't stay the way that I am Deep within my soul. There's a battle for control, What am I trying to win Do I need another trophy, For having the deepest scar. Lord if you're the healer, I've always heard you are Then I'll surrender my life for your plan, Take me in the palm of your hand. Chorus: Just keep chipping away, Just keep chipping away, Lord you are the potter and I am only clay Even if it takes, every night and day. Keep chipping away, Keep chipping away, Keep Chipping away Lord. With these weary eyes, So worldly and unwise. I'm looking through a shaded glass. But someday I will see, The man You see in me, And these childish ways will all be past. Hook: Something's got to give, Please show me what it is, Can't stay the way that I am.